Brighton: everyone knows where it is. Well, everyone in Southern England. If you’ll forgive the cliché, the sun always shines when I visit the seaside town. This time, however, it didn’t. 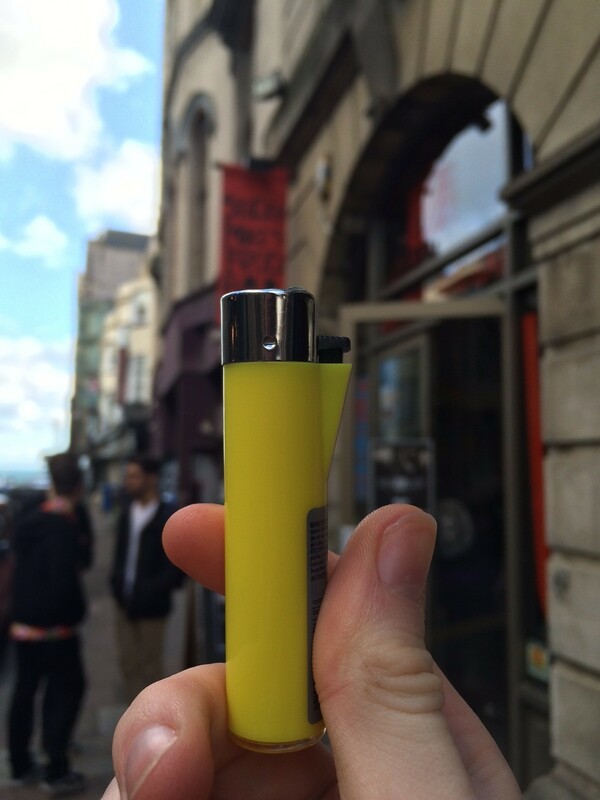 That’s why I picked a yellow lighter for this trip; if I couldn’t have the real sun, I could at least have a little sun in my pocket. When I think of Brighton, I laugh a little, and not for the reason you may think. As a musician, I can tell you that a great percentage of England’s musical projects, including many of the bands that I have played with so far, seem to originate from Brighton. It was only an inevitability that my band (Before This Silence – got to take every opportunity to promote it!) would play there. Let me tell you now: that was a gig and a half. Not in a good way. It was a very draining affair. A lot of effort went into making sure this show went smoothly. The four days previous were spent practicing, and they weren’t wasted, but the actual night was questionable and it was nothing to do with us. Believe me, when we play bad, we know and the audience knows. The venue we played at was a place called Sticky Mike’s Frog Bar, located down a street from the main road adjacent to the beach. It is one of a few in Brighton. They all seem to be closing down, which is a shame really. To get to Sticky Mike’s is easy enough: follow the road down from the train station until you reach the beach. Then, once at the beach, walk down towards the pier until you reach the first fish and chip shop. Turn left and it’s down that inner lane. As I said, there is a chip shop on the corner. There is also a café next to it. Unsurprising, as it’s a seaside town. Brighton is a nice place to be and the sea breeze is good if that doesn’t make your face flare up like a firework on New Year’s Day. The food in Brighton makes me wish that I was a Brighton-er. The pier is good fun if you have some spare coins to burn through. The only real downside that I faced though was the fact that in some places, *coughs* Burger King, the toilet is available to only those who pay or have proof of purchase. Not very good if you have travelled the whole day. Still, I’m never going to argue with an excuse to get me a Big Whopper!